Ok, I think I've gotten to the point where I need some help with my photos. It's time to take a class. This winter light is just too harsh for me to deal with. These turned out ok, but, try as I may, post processing has not made them look natural or anywhere close to as good as I'd like them to look. I took photo through middle school and high school, but it was for old fashioned cameras (digital cameras still took floppy disks). What I do remember from class seems hard to apply to my digital SLR, even though it should translate just the same. I get by on luck, is what I'm trying to say. How did you learn about lighting and photo editing? This skirt is from a fantastic set a got at Value Village after Thanksgiving. It came with a matching belt and blouse (not shown). Unfortunately, one of it's previous owners wore it with a blue jacket or cardigan that was not colorfast and so the blouse has some blue stains on the arms. I've decided to keep it and sell the skirt and belt. You can buy the pair on my Etsy shop! 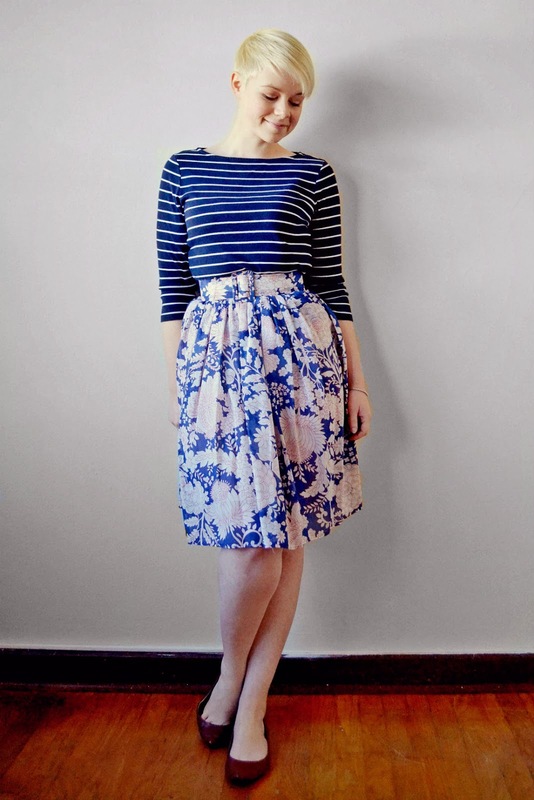 You can also buy the striped bateau top I've paired it with! This is so cute! I love the skirt! I don't like the winter light either. Cloudy days are supposed to be the "best light", but all it does is make my photos super warm and my hair look orange. I end up just putting my white balance on Auto and snap away. I'll bump up the ISO to about 200 or maybe 400 if it's a dark cloudy day. I have a 50mm f/1.8 lens, but I don't usually take my photos with the aperture wide open. i'll set it to Aperture priority mode, and stop it at 2.8 for close up shots and 3.2 for full body shots. I like doing photos in the summer when the sun is high on the sky and you get bright, lit up photos without harsh shadows! I think your photos came out fine though for indoors. My indoor photos are always crap! I took a simple class on my DSLR and it gave me the background knowledge to know enough about what I'm doing to get the results I want most of the time. I also had to invest in the right lens for what I wanted my camera to do. That made the biggest difference, for sure. I've been itching to take more classes, though. Let me know if you find a good one. It'd be fun to go with a friend!